Tree Tops Resort in Gatlinburg, Tennessee! - Buy a 7 Night Stay in a 1 or 2 Bedroom Suite! Enjoy a 7 Nights Stay in a 1 or 2 Bedroom Suite at Tree Tops Resort in Gatlinburg, TN! 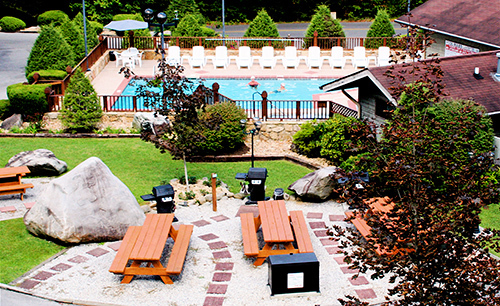 When you’re not basking in the glory of Great Smoky scenery, the resort offers plenty of amenities, beginning with lots of swimming options—three outdoor pools, two kiddie pools, an indoor pool, five hot tubs, and a sauna. There’s also a putting green, shuffleboard court, basketball, fitness center, playground, gas barbecue grills, an indoor racquetball court, and a full-time activities staff. Complimentary laundry facilities are available to guests. A great vacation spot for families, Tennessee's Tree Tops Resort is an absolute favorite for families. Set among the beautiful woods with the breathtaking Smoky Mountains as a backdrop, guests enjoy everything from trout fishing and secluded hiking paths to nearby downhill skiing in winter. Exciting Gatlinburg offers no end of activities and attractions with shops, amusement parks, and much more, all at the gateway to America's favorite National Park. Units feature fireplaces, whirlpool tubs, cable TV with DVD/VCR, iron and ironing board, central heat and air, telephone service with direct numbers, and private balconies. For cooking in, fully equipped kitchens have all the utensils and small appliances you'll need. Your 2 BEDROOM SUITE will sleep up to 6 guests and has a full kitchen. THE FOLLOWING DATES ARE AVAILABLE IN A 2 BEDROOM SUITE! Not all units have elevator access.